Home Gaming Lifestyle Children & Video Games. 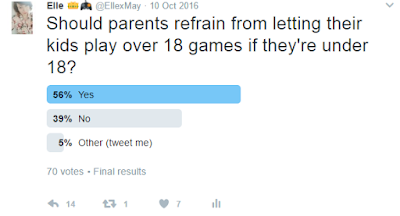 Last year (October to be exact) I did a poll on twitter asking my follows "Should parents refrain from letting their kids play over 18 games if they're under 18" now before people go on to me about how 18 is an adult and they can do as they please, I chose that age as I have followers from all around the world who live in countries with different laws when it comes to age. I had lots of different responses to this topic which I was hoping for, The overall amount of people in the poll said that parents should refrain from this, for me it's one of those questions that have more than one right answer, I'm not a parent but growing up my parents didn't mind us playing violent games, but to an extent and by that I mean games such as crash bandicoot, Spyro, street fighter, Pokemon stadium and tomb raider (which were the main games we played), my parents didn't mind as the games didn't have any effect on us and we weren't that impressionable so things like that wouldn't make us want to fight other people. Of course, this is the top of my list, why wouldn't it be? It has all the elements for the perfect children's game, it opens a whole new world when it comes to being creative and kids are able to play it on or offline, they can even have their friend/family join in using another controller to help them build and let their imagination run wild. For parents, there is a feature where you can turn off all the monsters which allow your child to play without seeing or experiencing any violence. I've seen many videos of this game on Youtube and it is absolutely stunning, the story focuses on a child which helps the child playing the game feel more like they're part of the game. It is a platform game set in a mythical land called Lemuria, the child you play as is called Aurora who ends up finding herself being spirited away and took to Lemuria. The sun, moon, and stars have all been taken and are being held captative by the Queen of the Night and you have to find a way to free them from her. I'm a full grown adult and I still have hours playing these games, there are a number of different versions of the game and right now I'm playing little big planet 3 which is free on PSN plus right now, the games are all narrated by Stephen Fry, the games are all puzzle based where you go on adventures as Sackboy, I would say the games are more about being creative rather than story based even though they do have stories behind them. My favourite things to do in Little big planet was creating my own planets, other players online are able to access and play these games, there are so many you can choose from! I'm not gaming to name them all because they all have so many different stories and good things about them so if your kid likes Lego they will love the games. Lego has been around for so long now it was no surprise how popular these games are actually are even when it comes to adults, They would be my main choice in video games when it came to kids because it's such a child friendly game, the movies aren't that bad either. This doesn't just focus on violence in video games I also want to address how to keep them safe online too. What worries me about this generation of children even more than violence in games is how easy it is for stranger to speaking to them in a video game, I'm not saying that all children should be stopped from going online but what I am saying it parents can easily monitor a child on facebook or twitter but when it comes to video games it isn't so easy or they don't think of checking to see who their children speak to online. I know at some time in your child's life you have to be less protective and trust them but at the same time, it doesn't hurt to keep an eye on who they speak to. I actually can't believe I just wrote that because I would have been mortified if my parents were checking up on me like that. I hope you enjoyed my post if anyone has anything to add to it feel free to leave a comment! This is a really great post Elle! Myself, growing up playing games, my mum never worried about the games I was playing as, as you said, the games that were seen as desirable at the time weren't so violent. I played mostly platformers and RPG games, I found around the time my brothers were a couple of years old it seemed that shooting/violent games became all the rage for kids. It's amazing how much gaming has advanced over the years with the technological advancements that allow us to play and connect with people online. I really don't understand how some kids are let off with some of the stuff they say online and it's probably been heard from their time online and playing these games with others. So it definitely is important to keep your kids safe online (I mean with the amount of kids shouting "kys" at people online, it could easily influence a young child to do exactly that). I know myself with Rinoa, I am not going to be letting her play games that I think will be impressionable in a bad way at a young age (I think as you get older I feel that games aren't so much of an issue on influencing violence, though that depends on the person playing and how they let the games affect them). I actually want her to play the games I played when I was younger (such as the games you mentioned along with the Final Fantasy games (duh :p) and others!). I never showed any interest in 18+ games until I was even 21 or so and even then they're not my main interest. I think the games you are surrounded with (like what your parents/siblings play) can have an influence on the games you play as well. I remember my brothers dad only playing kid-friendly (non-violent) games when I was around and playing his shooting games while I slept. My brother was majorly influenced by the games I play and he, now 16, still plays the same kinds of games as me. I have known parents to buy Call of Duty for their 8 year old after letting themselves be pressured by their kids to buy them it, which I personally think is irresponsible. This comment was longer than intended, but hey ho! I really did enjoy this post and loved the infographic you included!